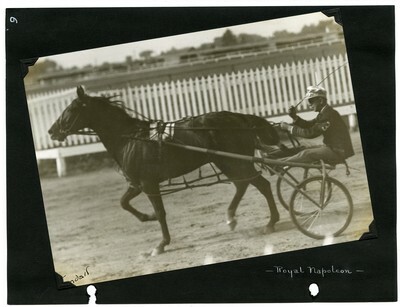 Black and white photo of chestnut stallion, pacer Royal Napoleon, owner/driver V. A. Crockenbrug of Binghamton, N. Y. up for the one and one-sixteeth mile pace during the Yankee Circuit races at Northampton Driving Park, Northhampton, Massachusetts, July 4, 1935. Royal Napoleon won the first place $100 purse in the contest. The photograph is signed by the photographer in the lower left corner.